H.E. Dr Workneh Gebeyehu, Minister for Foreign Affairs of Ethiopia and President of the Security Council for September, chaired the meeting of the UN Security Council on Threats to International Peace and Security on 21st Septmber. 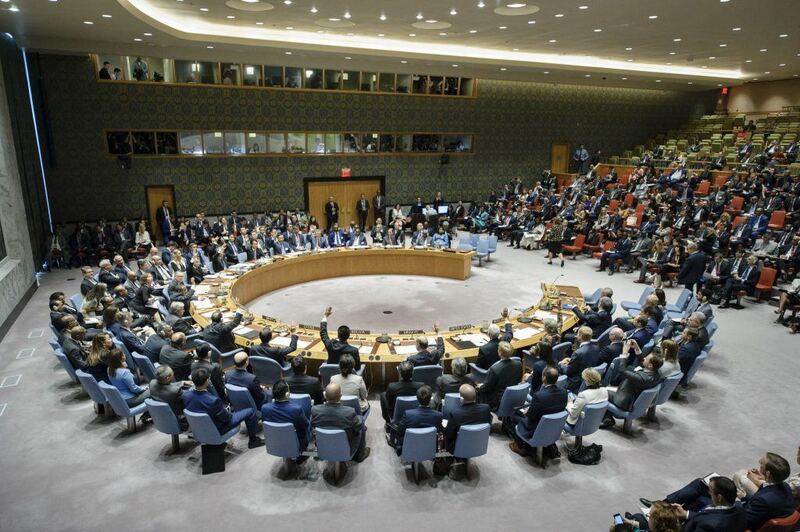 The Security Council unanimously adopted resolution 2379 (2017), requesting the Secretary-General to establish an Investigative Team to support domestic efforts to hold the Islamic State in Iraq and the Levant (ISIL, also known as Da’esh) accountable. The Investigative Team will assist in collecting, preserving, and storing evidence in Iraq of acts that may amount to war crimes, crimes against humanity and genocide committed by the terrorist group ISIL (Da’esh) in Iraq. Dr Workneh’s statement to the Security Council. Check against delivery. I now speak in my capacity as the Foreign Minister of Ethiopia. We welcome the unanimous adoption of resolution 2379 (2017) on ensuring accountability of members of ISIL (Da’esh) for their crimes in Iraq, including where those may amount to crimes against humanity. We would like to thank the penholder (United Kingdom) for all its efforts on this text. The adoption of this resolution today is indeed an appropriate response to the request made by the Iraqi government calling for the assistance of the international community in ensuring accountability of members of Daesh for the crimes they committed. We would like to take this opportunity to express appreciation to the Government of Iraq for all its efforts in this regard. The presence today of the Iraqi Foreign Minister demonstrates the importance that his government attaches to this matter. No doubt, ISIL/Da’esh constitutes a global threat to international peace and security, and this doesn’t require lengthy explanations. It is self-evident. Through its commission of acts involving murder, kidnapping, hostage-taking, suicide bombings, destruction of cultural heritage, Da’esh has committed very serious crimes which may amount to war crimes, crimes against humanity or genocide. We will never forget the loss of our Ethiopian compatriots who were mercilessly massacred by ISIL/Daesh in Libya and that is why we supported this resolution which aims to hold members of ISIL/Da’esh accountable for the crime they committed in Iraq. The adoption of this resolution is indeed very significant not only to address the plight of the victims and to serve justice; it will also greatly assist in countering terrorism and violent extremism. The proper collection and preservation of evidence related to crimes that have been committed by ISIL/Da’esh is indeed critical to ensure accountability. In this regard, we support the establishment of an Investigative Team, headed by a Special Envoy, to support Iraq’s efforts by collecting and preserving evidence in Iraq of acts that may amount to war crimes, crimes against humanity and genocide committed by ISIL (Da’esh). This, we believe should be done with full respect for the sovereignty of Iraq and its jurisdiction over crimes committed in its territory. In light of the severity of the crime committed by Da’esh and the magnitude of the challenge the country faces, Iraq will need appropriate technical support and capacity building. We understand that it is in this context that the resolution encourages Member States, and regional and intergovernmental organisations, to provide appropriate legal assistance and capacity building to the Government of Iraq in order to strengthen its courts and judicial system. Let me, therefore, conclude by expressing our full support to the efforts aimed at ensuring accountability of ISIL/Da’esh members for all the crimes they committed not only in Iraq but also in other parts of the world. The UN Security Council today authorised the establishment of an investigation team to support Iraq’s domestic efforts to hold the Islamic State of Iraq and the Levant (ISIL/Da’esh) accountable for acts that may amount to war crimes, crimes against humanity and genocide committed in the country.